SEATTLE – An ad on Seattle buses placed by the FBI that shows the faces of 16 wanted terrorists is racist, because all of the men appear to be Muslim, charges Rep. Jim McDermott, D-Wash.
McDermott is known to some critics on the right as “Baghdad Jim” for stating on Iraqi soil in the run-up to the war that he essentially trusted dictator Saddam Hussein more than President Bush, whom he called a liar. The trip later was discovered to be financed by Saddam’s intelligence agency. When Saddam was captured, the congressman accused the administration of having waited until the opportune time politically to seize the Iraqi leader. The Seattle Weekly reports McDermott sent a letter to the FBI requesting that the agency remove an ad that shows 16 faces of Most Wanted Terrorists, who all appear to be Muslim. “But their faces are missing from this campaign,” he writes. Thirty of the 32 people listed on the FBI’s Most Wanted Terrorists list appear to be Muslim. The two non-Muslims are a member of the revolutionary Black Liberation Army who escaped from prison after being sentenced in 1973 and an animal-rights extremist wanted for a 2003 bombing. The ad by the Puget Sound Joint Terrorism Task Force is part of the U.S. Department of State’s Rewards for Justice Program announced June 4, which offers up to $25 million for information that helps stop terrorism. The task force is an initiative of the FBI that employs the resources and skills of local law enforcement to prevent acts of terrorism and to solve terrorism cases. “Many despicable plots from illicit drug trafficking to violent acts of terrorism have come to the FBI’s attention because vigilant Seattleites came forward with a tip,” the statement says. McDermott traveled in 2002 to Baghdad with then-Rep. David Bonior, D-Mich., and Rep. Mike Thompson, Calif., to argue against the U.S. going to war to oust Saddam. 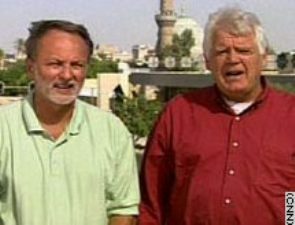 Democratic Reps. David Bonior and Jim McDermott interviewed by ABC News in Baghdad in 2002. In 2008, a federal indictment unsealed in Detroit charged that Saddam’s intelligence agency secretly financed a trip to Iraq for three U.S. lawmakers. The indictment didn’t name the lawmakers, but the dates correspond to the trip by McDermott and his two Democrat colleagues. Muthanna Al-Hanooti, a member of a Michigan nonprofit group, was charged with arranging the trip at the behest of Saddam’s regime and paying for it through an intermediary. McDermott was accompanied on the Baghdad trip by an Iraqi-American businessman who admitted to financial ties with Saddam’s regime. In 2004, McDermott returned a $5,000 contribution the Iraqi made to the congressman’s campaign fund. Former FBI officials told WND in 2003 that Bonior previously hampered FBI efforts to investigate terrorist suspects in Detroit, which became a hotbed for al-Qaida sympathizers and cells. KIRO radio’s Dave Ross asked McDermott whether the capture was timed to help President Bush. “Yeah. Oh, yeah. There’s too much by happenstance for it to be just a coincidental thing,” McDermott said. Ross, who made an unsuccessful run for Congress as a Democrat, pressed further to be sure he understood McDermott’s point. “I don’t know that it was definitely planned on this weekend,” the congressman said, “but I know they’ve been in contact with people all along who knew basically where he was. It was just a matter of time till they’d find him. The surprising thing is that the Puget Sound JTTF, which is predominantly FBI driven, and a State Department sponsored program are actually running this ad which truly reveals our enemies. The ad identifies the terrorists for who they are, Islamic extremists. Obama must not be aware of this, or you just know he’d stop it. Kudos to the FBI and State Department in Seattle.